There’s a cookbook I bought years ago called San Francisco Flavors, compiled by the Junior League of San Francisco. While I never thought I’d have much use for something that seemed so high society, over the years I’ve found a lot of useful recipes. 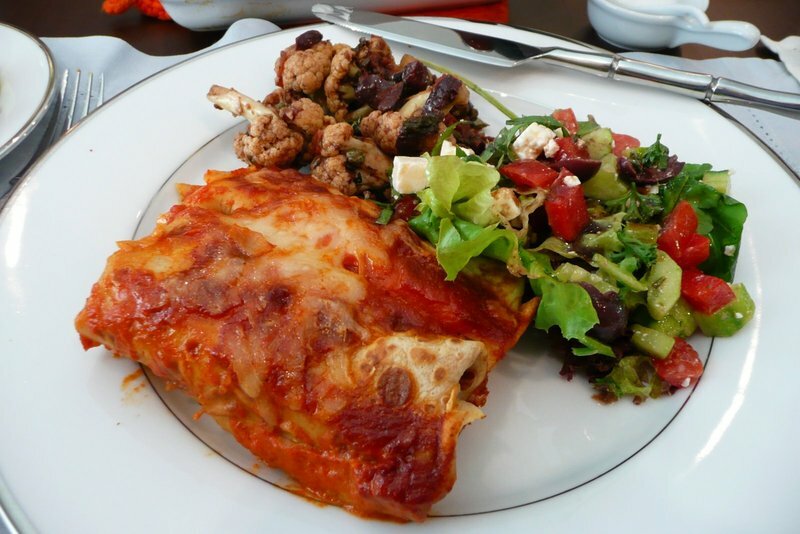 The recipes make good use of locally available ingredients and given the Bay Area’s Mediterranean climate, many of the dishes have flavors that echo those found in the Mediterranean region. This afternoon we had two friends over, Tammy and Roka. Tammy is the sister of a friend I worked with during my high school days spent tearing tickets and popping popcorn at a cinema. She’s now living here for a few years. We’ve known Roka for a few years now and she’s recently moved back after a year in Australia. They made for perfect company on a Sunday afternoon for brunch. Above, Chris, Tawn, Roka and Tammy. I don’t think Roka and Tawn coordinated, but maybe. I need to think more carefully about my placement in photos – I look huge! The meal centered on two dishes from San Francisco Flavors, both of which I ended up modifying just a little. The first one was a cauliflower dish served at room temperature. 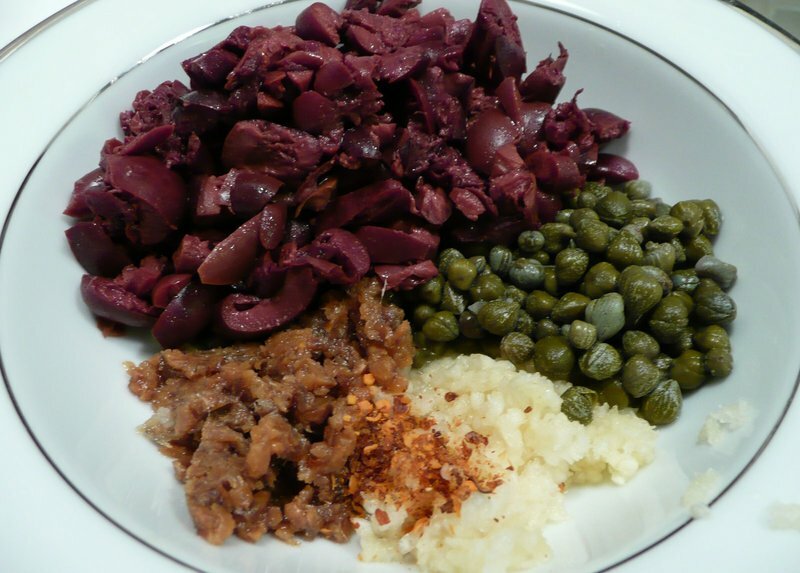 Clockwise: kalmata olives, capers, garlic, chili flakes and anchovy paste. In this case, not having anchovy paste I just minced several anchovy fillets. Add some tomatoes, parsley, rosemary, and thyme and you have your dish. You sauté the cauliflower until just starting to brown but still crisp. Remove from the pan and then cook the savory ingredients for several minutes until soft. You then add the cauliflower back and cook for a few more minutes until starting to get crisp-tender. In a small saucepan you bring a bit of balsamic vinegar, sugar and tomato paste to a boil then pour it over the cauliflower mixture. The whole thing is allowed to marinate overnight before serving at room temperature with some additional thyme added to it. 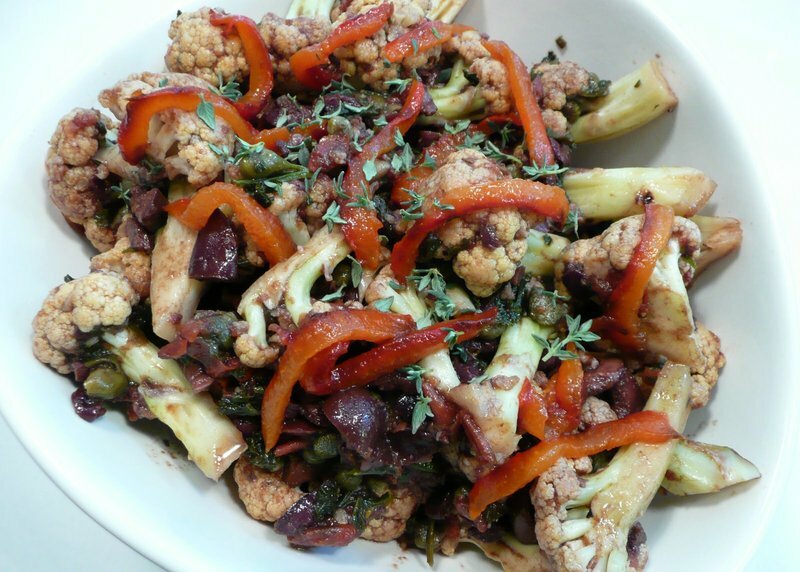 This turned out to be a very tasty way to serve cauliflower. 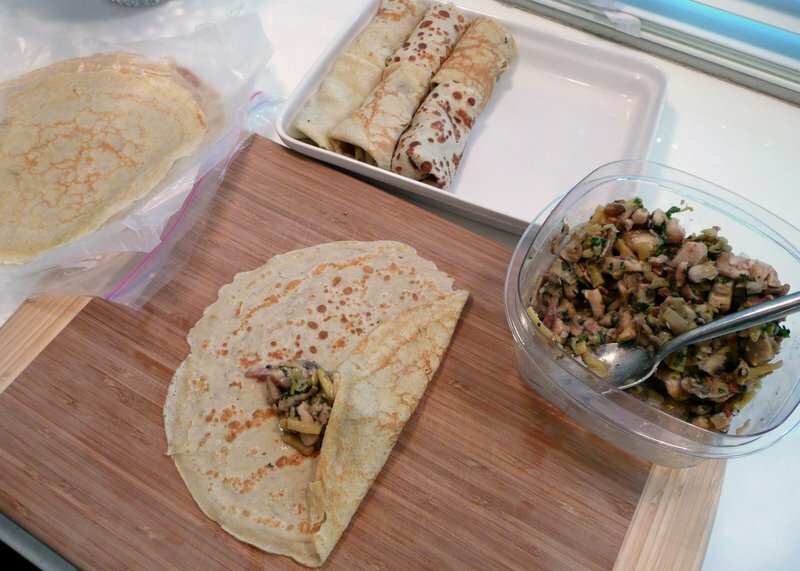 The main dish was crepes stuffed with a chicken, apple, and mushroom filling. The original recipe called for regular crepes but I used buckwheat flour mixed with all-purpose flour, which lent the crepes a little more heft. When making the crepes the night before (something I like about crepes is you can make them in advance) they were a little delicate. I need to look for a better buckwheat crepe recipe, one that tears less. The filling takes onions and mushrooms (supposed to be shitake mushrooms but one of my guests isn’t a big fan of shitakes) and sauté. Pull that out of the pan then cook the chicken, which has been cubed and dusted in flour to help thicken the mixture. I deviated from the recipe a bit and marinated the chicken breasts in soy sauce and sake to give it a bit more flavor. Then you clear the pan again and sauté the apples, finally adding everything together with some pre-cooked and crumbled pancetta. I substituted regular smoked bacon. Add some chicken broth and cook for a few minutes until the liquid is reduced. I finished up with some parsley and salt and pepper to taste. The filling process this morning was easy enough – a small scoop of the chicken mixture then fold like a burrito, tucking snugly into the dish. Nice colors, huh? The spots are on the “second” side of the crepes whereas the lines that look like the surface of the moon are from the first side on which the crepes are cooked. I mixed it up a bit so there would be more visual interest. 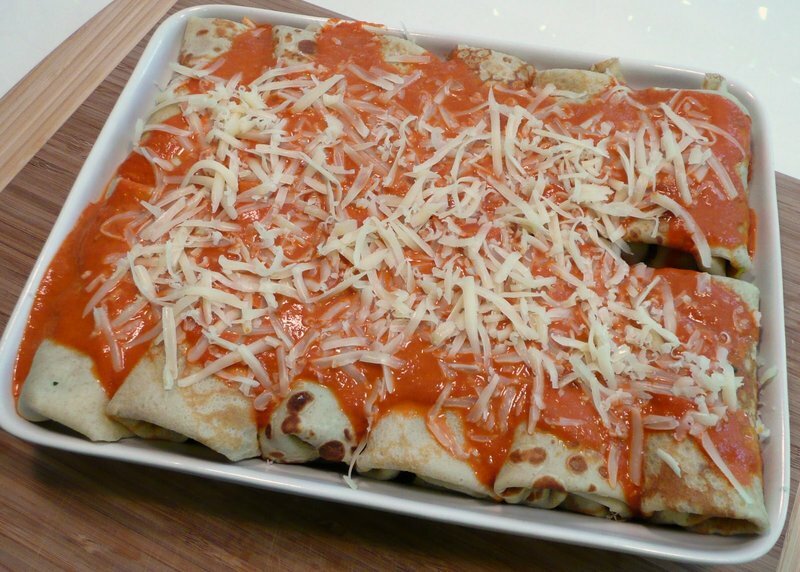 The original recipe has no sauce on top and you just sprinkle cheese and bake. This seemed a bit dry so I made a roasted red bell pepper cream sauce and poured that on first. Almost any time I have the oven on I go ahead and roast some peppers. They store nicely in the fridge and add a wonderful flavor to many dishes. The sauce was easy to pull together and the flavor and color brightened the overall dish. The finished dish turned out very nicely and with twelve crepes would have been enough to serve at least six people. 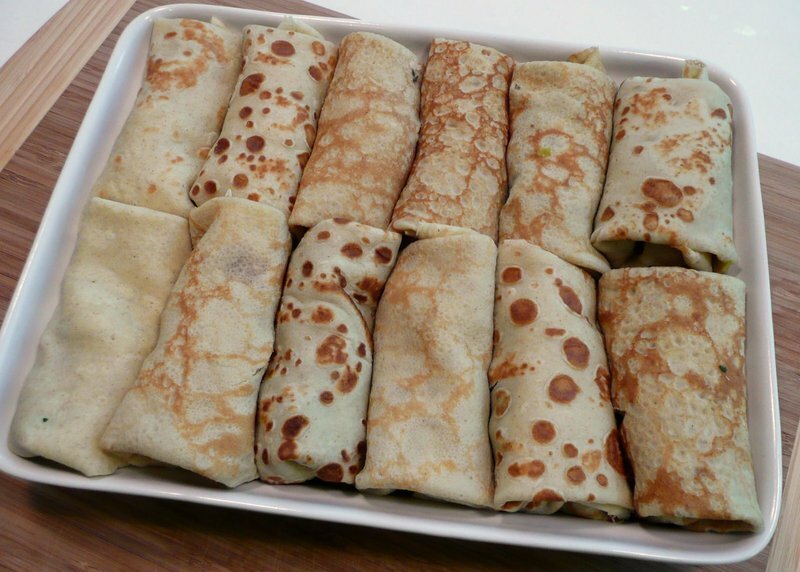 In fact, given how filling buckwheat flour is, one crepe per person would have been fine! 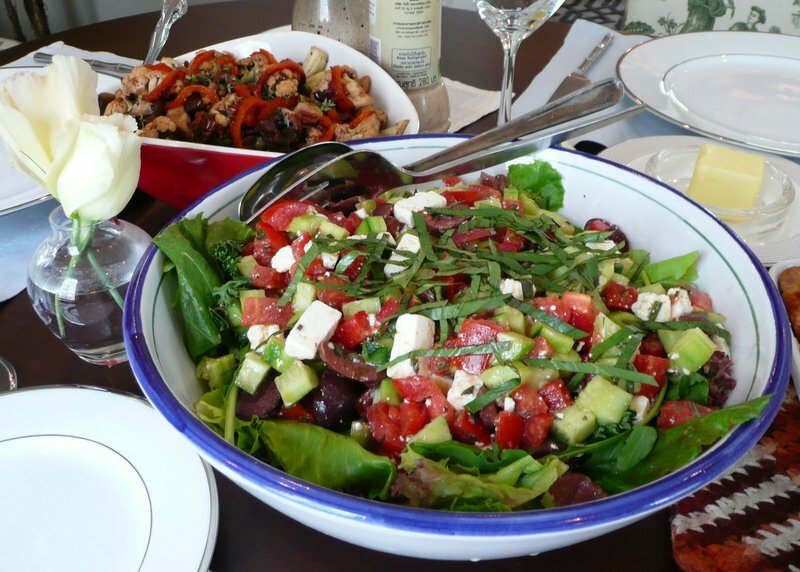 With those two dishes anchoring the meal, all I needed was a nice salad to round things out. I went for a Greek style salad with cucumbers, tomatoes, bell peppers, and the rest of the kalmata olives, all tossed in olive oil and basil and served on a bed of greens. Served with a glass of Argentine Viognier, it proved to be a very satisfying meal. A nice accompaniment to the pleasant company! I hope your Sunday was great, too. This entry was posted in Uncategorized and tagged Brunch, cooking, food by christao408. Bookmark the permalink. 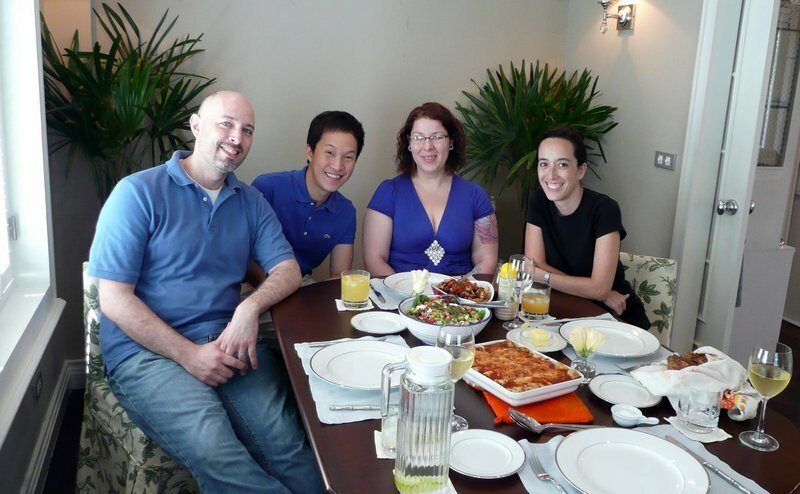 The food looks wonderful – as usual.Hmmm 4 table settings = 4 guests includingyourself – so who took the pic ? Or is itone of those time lapse cameras that you set then sprint back to your seat before the flash goes off ? Great group photo. Ooh, I really enjoyed all these pictures. that looks so good, i was swallowing saliva without realizing it haha. 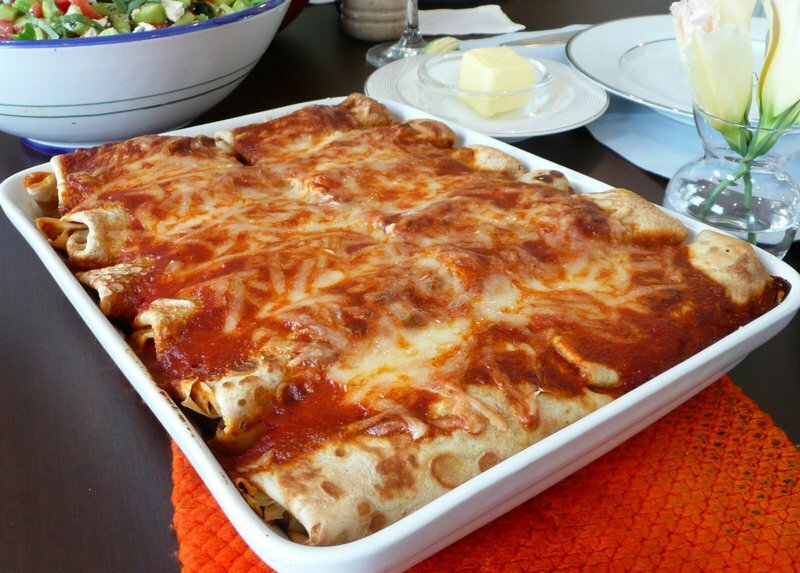 that’s an interesting twist to an enchilada, how’s the apples in them? must have added a really refreshing touch in contrast to the sauce/cheese! I love the way you take a recipe and tweak it. Your results are almost always an improvement. 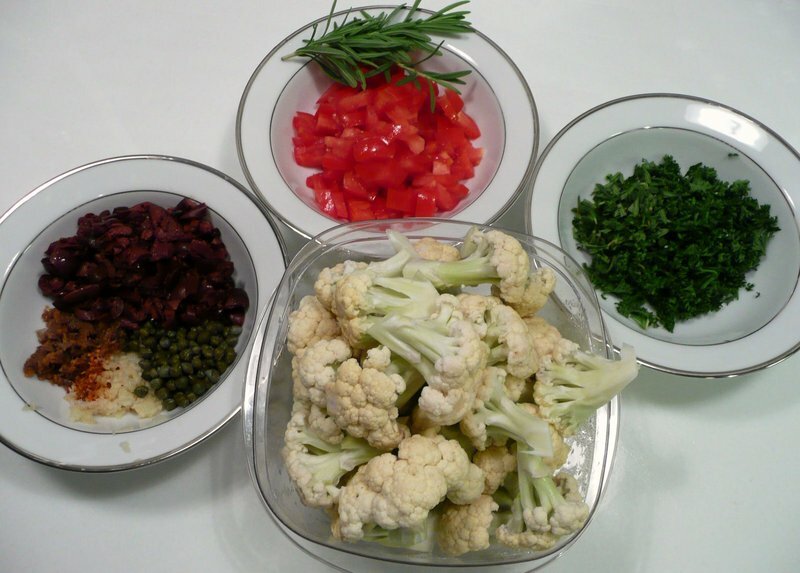 My husband is not a cauliflower fan because he detests the soggy boiled or steamed stuff. I’m betting he would love this recipe! The ingredients are so colourful, I like the melted cheese on top as well; what a sumptuous Sunday brunch! Did you made all these by yourself? @jandsschultz – Flower vs. flour – sorry about the misspelling. One thing I’ve noticed since moving to Thailand is that where I was once very attentive to spelling, my mind is no longer so sharp especially when it comes to homonyms. I don’t know if it is because Thai is a more phoenetic language so I’m increasingly thinking in terms of “just sounding it out” or if it is just a lack of attention. Thanks for catching the mistake, though. @CurryPuffy – Indeed I did make these all by myself without the benefit of a sous chef, who was busy with other things. @murisopsis – Well, it was nice that it had a bit of a bite to it, so he would not suffer the sogginess often associated with cauliflower. But one of our guests is not a big cauliflower fan and while she didn’t dislike the dish, she was kind of so-so about it. Her theory, which I can appreciate, is that if a vegetable has to be drenched in something to give it flavor, it probably wasn’t worth eating in the first place! @ElusiveWords – Stop pumping iron? I need to start! The sad thing is, since the new year I’ve been very rigorous about exercising, on the treadmill fifty minutes every other day with about twenty minutes running and thirty walking. My weight isn’t changing at all but my face and shoulders are getting slimmer. The stomach and waist doesn’t seem to want to give anything up, though! Grrr…. @stebow – Thank you. I suppose if I ever tried a recipe as it was originally written, I would at least have a baseline against which to compare the tweaked results! =D@secade – Yes, when are you coming over for brunch? 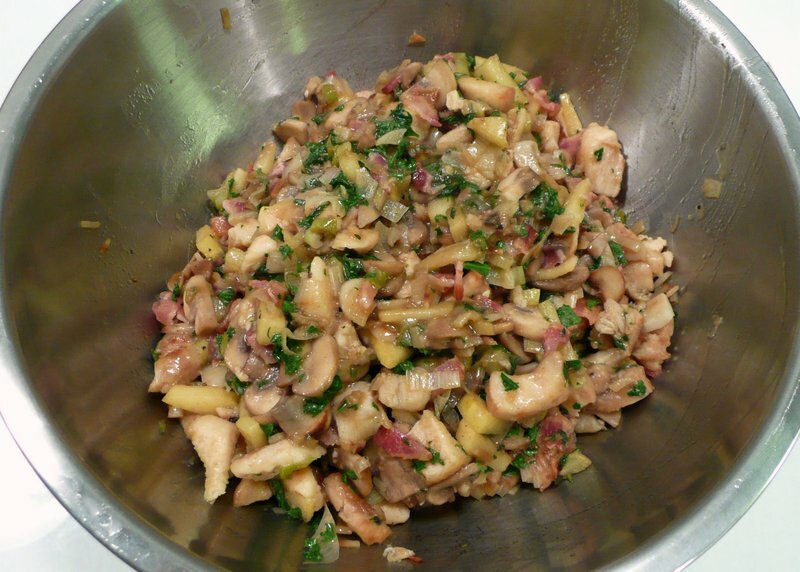 @iskrak – The apples are a really nice addition to the mushroom, chicken, and bacon mixture. Adds just a little sweetness that is very pleasant. @decembriel – I’m glad you enjoyed them. @TheCheshireGrins – My, you’re Miss Productive today. Such an inspiration to us all! =)@Chatamanda – Tripod + automatic timer on the camera. Got to love technology. Such wonderful recipes to treasure Chris! Every thing looks so elegant and delectable. Wow! That looks fantastic. Is buckwheat flour known to be very filling? The other day I had a serving of soba with broth and vegetables and I was full for hours longer than I would’ve expected for a starchy meal of only ~300 calories. It was the first time I’d had soba, so I was surprised, but you mention buckwheat as being filling too.BTW, do you have a special pan for making crepes? The marbling and spots on yours are beautiful!